As I hope you’ve heard, this month TBG is hosting one of the world’s leading and most influential garden designers for a special series of workshops and lectures. We’re very excited that John Brookes is visiting TBG between February 18 and 25, 2014. Brookes is presenting lectures and delivering courses. What an incredible opportunity to learn from a world-renowned expert! To read more about his visit, including the program schedule, descriptions and prices, please click here. 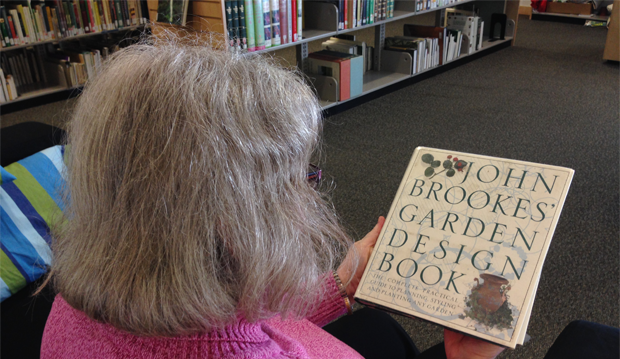 Brookes is well known as a prolific author and one of today’s original and emulated garden designers. He’s also written more than 30 books on a variety of topics in garden design. The TBG’s Weston Family Library features many of his works, which can be borrowed by members for up to three weeks. Below is an annotated list of works by John Brookes and other notable garden design titles available in our library. Click the title’s link for more detail about its location. Following an exploration of the principles and practices of natural gardening, and the basic design elements of the natural garden, the book engages the reader in an in-depth look at specific sites such as coastal, woodland and wetland gardens. Copiously illustrated with how-to diagrams, garden plans and abundant full-colour photographs. Ideas, advice and inspiration accompanied by glorious full-colour photographs, black and white garden plans and how-to inserts. Truly inspiring and full of stunning photography. This book teaches you step-by-step—from drawing board to finished garden—how to conceive, lay out and realize a design. Chapters cover learning to design, styling the garden, designing with plants, solutions, ingredients of a garden, plant selection and working information. Beautifully illustrated with inspiring photographs and site plans. A book to stimulate ideas, open up possibilities and explore consequences. Includes many photographs, solutions to particular problems such as restoring an existing garden, and a chapter on maintenance and protection. Beautiful illustrations of a variety of garden types and specific details. Organized seasonally, each section highlights a different aspect of gardening such as structural planning and other cold-weather topics. Chock full of beautiful and evocative photographs, charts and diagrams, the book explores innumerable types of gardens: woodland, gravel, flower, cottage, enchanted, water and so on. Good design is key to all successful gardens, large or small, urban, country or suburban. Brookes’ lucid and informative description of the fundamental principles and techniques make this book the ultimate garden ideas book. Illustrated with hundreds of full-colour photographs, drawings and plans, this is the essential sourcebook and guide for all who pursue the ideal garden. Written for both the outdoor and indoor gardener, Brookes offers a wealth of information about developing and maintaining every conceivable type of garden and includes construction methods and maintenance tips. Part one focuses on outdoor gardening, while part two deals with indoor plants and their decorative properties. Replete with inspiring photographs, maintenance methods and indoor plant care. Indispensable practical advice on how to work in harmony with nature at every stage of your garden’s development—from the basic design and selection of materials for hard features, to choosing and positioning plant communities and introducing garden art. Illuminating photographs, charts and garden plans. The author clearly states that it is the art of design, not the craft of horticulture, that principally interests him. But his design philosophy always encompasses a relationship with nature: the nature of landscape and how the garden fits into its surroundings. Each chapter explores its subject in depth: setting, shape, direction, levels, enclosure, entrance, surface, structure, planting, water and style. A wide range of inspiring ideas, extraordinary photographs, annotated sketches and diagrams are presented in this exceptional garden design book. A pocket encyclopedia with many plans and diagrams and inspiring photographs presented in five chapters: choosing a garden style, planning your garden, creating the garden structure, plants and planting, and plant selection guide. A complete quick-reference guide to the characteristics and cultivation of more than 4,000 popular plants includes planning your planting, planting your garden, the plant-finder’s guide, climate zones and plant hardiness, and how to find plants. Includes garden plans, colour photographs and line illustrations. The book explores aspects of creating “a pleasant place to be” from site characteristics, front, rear and and yard gardens, and other situations. Copious photographs and garden plans, as well as basic construction details, horticultural techniques and a plant list. A down-to-earth approach. A comprehensive exploration of various types of gardens and the steps to attain them: planning, garden types, constructing, choosing and using plants, finishing touches and a complete description of care and maintenance. Lots of full colour pictures and line illustrations illustrate the concepts. The author considers the Islamic traditional garden and the idea of a garden as a symbol of paradise. Well illustrated with photographs and concludes with notes on designing a garden in the Middle East. Beginning by exploring colour theories and aspects of colour—value, colour combinations and colour in the context of light, of texture and of time’s alteration—the text evolves to discuss plant colour combinations and composing with colour. Beautiful colour photographs illustrate the concepts. This practical and inspirational encyclopedia delivers everything you need to plan, build and plant the perfect outdoor space. Chapters cover how to design, choosing a style, making a garden, and include a plant and materials guide. A range of colour photographs, plans, diagrams, a comprehensive plant guide and materials guide. Chapter topics cover The Five Senses: a new way to think about what to plant; The Essential Design Elements: How Deliberate Gestures Shape the Land; Plants as Design Tools: What Plants Can Do for You; Plans for the Whole Garden: Ideas to Borrow from a Wide Choice of Styles. Sidebars provide lyrical ideas to enhance the topic discussed. Mouth-watering, full-colour photographs inform and inspire. The book showcases the best ideas, trends, styles and techniques from the Chelsea Flower Show. It identifies the most attractive, practical and portable ideas, and analyses how these ideas may work in any garden. Expert tips by the garden designers are practical suggestions, inserted throughout the book. Copiously illustrated in colour. Beginning with an explanation of gardening and design basics, the book helps you assess your own plot before moving on to discuss the cost, suitability and upkeep of the various materials available. Well illustrated with colour photographs. This Canadian publication features 10 home gardens and their reinvention. Photographs, plans and dos and don’ts accompany each garden makeover, as well as features about materials, waterworks, small space tricks and plants offer a wealth of ideas for the garden enthusiast. David Steven’s unique approach to garden design as an outdoor room with floors, walls, ceiling and furnishings, with a chapter on maintenance and renewal. Illustrated with more than 200 colour photographs, plans and diagrams. A practical guide with ideas for every style, guidance on the basics of design, adapting plans and how to deal with difficult sites. Contains advice on choosing plants for specific locations, special conditions and different effects. Illustrated with plans, photographs and step-by-step features. Discusses city yards, suburban yards, country yards, rooftops, the practicalities, gardening basics and such things as pools, garden structures, paving, etc. Illustrated with photographs, line drawings and garden plans. List compiled by Jean Gardiner, library volunteer and Toronto Master Gardener.